Hi Stampers. Mother’s Day is quickly approaching, so I thought I’d dig through my stamp stash and come up with a few options to sell in my Etsy store. I just love how this one came out! It features the Stampin’ Up! Crazy About You stamp set that is about to retire. I love that set because it covers so many occasions all in one set. It’s very useful! For the card base I used the soon to retire, Tip Top Taupe. I’m gonna miss that color! I cut the card base 8.5″ x 5.5″ and scored at 4.25″. Next is a 5.25″ x 4″ layer of Pink Pirouette, with a 4″ x 2.5″ piece of Whisper White card stock and 1/2 of a doily. I added the doily with a few strategically placed mini glue dots. I then added a strip of the Sweet Sugarplum ribbon. 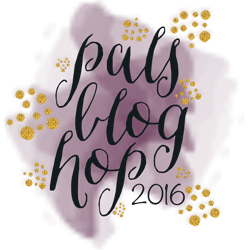 Stampin’ Tip: For the ribbon, I cut a piece 5″ long and wrapped it around the Pink Pirouette layer and adhered it with glue dots on the back side. I then adhered the Pink Pirouette layer to the card base with Stampin’ Dimensionals so that the bulk from the ribbon wrapped around the back would not be noticeable. For the focal point I stamped the flower from the crazy about you stamp set twice onto scraps of Whisper White card stock. Once in Sweet Sugarplum ink and once in Pink Pirouette ink. For the flower stamped in Sweet Sugarplum, I punched it out with the Flower Medallion Punch. For the flower stamped ink Pink Pirouette ink, I used my paper snips to fussy cut the outer most layer of petals off. I adhered the Sweet Sugarplum flower to the card base with mini glue dots and then the Pink Pirouette flower on top of that with Stampin’ Dimensionals and finished it off with a rhinestone in the middle. The leaves are cut using the Flourish Thinlit Dies and Garden Green card stock. I stamped the “Happy” and “Mother’s Day” stamps from the Crazy About You stamp set in the lower right corner of the white layer in Sweet Sugar Plum ink. The interior of the card is a 5.25″ x 4″ layer of Whisper White with a portion of the flower stamped in Sweet Sugarplum ink in the upper left and lower right corner. If you love this card as much as I do and want to make one of your own, I’ve included a list of supplies used below with links to my online store just for your use! Would you like a FREE copy of the new 2017-2018 Annual Catalog? Please contact me , I’d love to be YOUR Stampin’ Up! demonstrator!! Hi Stampers. Today I’m back with yet another Pals Paper Arts Sketch. I loved working with this sketch and I encourage you to play along with us. 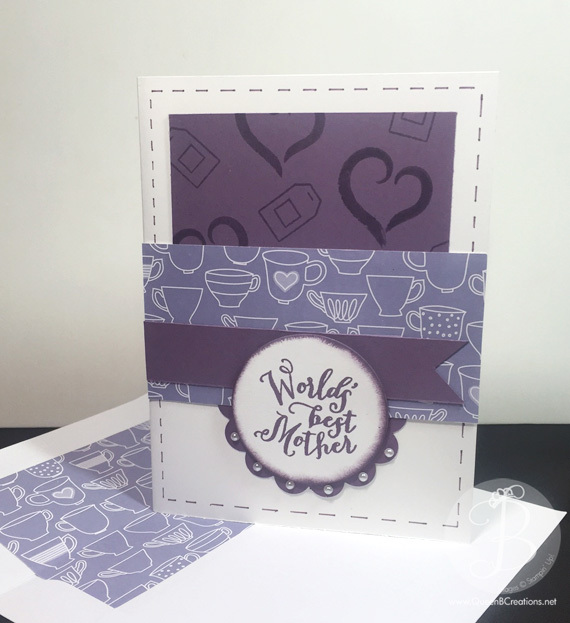 I chose to use the “Nice Cuppa” bundle and matching Designer Series Paper for a fun Mother’s Day card. I used our new THICKER Whisper White card stock for my card base. (I’ve been loving the sturdier version for card bases, but still love the thinner version for layers!) The base is 8.5″ x 5.5″, scored at 4.25″. Next was a 3.25″ x 3.25″ square of Perfect Plum. 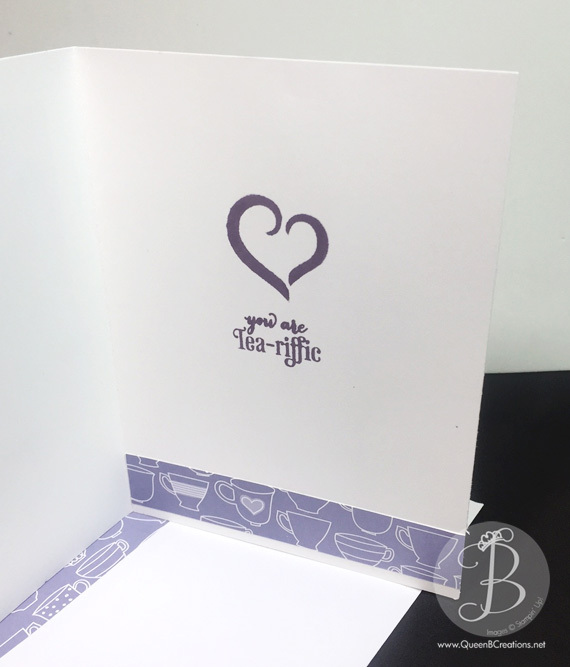 I stamped the hearts and tea bags from the Nice Cuppa stamp set onto the layer with Perfect Plum ink. I adhered it to the upper half of the card, making an even border on top and sides. Under that I placed a piece of Perfect Plum card stock cut out with the 2 3/8″ scallop circle punch. Next up is a 4.25″ x 2″ layer of DSP from the Have a Cuppa Designer Series Paper stack. (This is a handy stack of 6″ x 6″ squares of DSP – they are easy to work with and easy to store.) The flag was made with a .75″ x 4″ strip of Perfect Plum card stock. I used the #4 circle framelit (counting from center outward) to cut out a circle of Whisper White card stock that fit perfectly into the scallop circle. Onto that I stamped the sentiment and sponged the edges – with Perfect Plum ink. I then attached it with dimensionals and added a tiny pearl accent to each scallop. I used my Perfect Plum marker and a ruler to add the stitching around the edge of the card. For the interior of the card I stamped the same heart used on the front of the card and another sentiment from the same stamp set (A Nice Cuppa), stamped in Perfect Plum ink. To further my co-ordination, I added a .75″ x 4.25″ strip of the same DSP from the front of the card and used the leftover DSP from that sheet to line my envelope. It turned out kinda cute, if I do say so myself. *wink* I’ll see you over at Pals Paper Arts – can’t wait to see what you come up with! Don’t forget to check out the weekly deals! Stampin’ Up! offers new deals each Tuesday – follow my facebook page so you don’t miss out! Hi Stampers! I’m back today with another Pals Paper Arts sketch challenge. 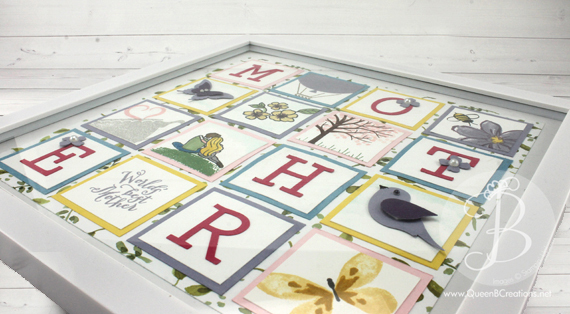 Here is a bright a cheery card – perfect for Mother’s Day, which is right around the corner. This card starts out with a Daffodil Delight card base, 8.5″ x 5.5″, scored at 4.25″. For this card, I used smaller borders than I normally use, I like it on this card. (These are 1/8″, most my cards are 1/4″ borders.) The next layer is our Painted Blooms DSP – 5 3/8″ x 4 1/8″. Next up is another Daffodil Delight layer 3 1/8″ x 4 3/8″ of card stock and a Whisper White layer 3″ x 4.25″ of card stock. On the Whisper White layer, I had stamped the flower from the Stampin’ Up! Crazy about you stamp set in Daffodil Delight ink and the leaves in Wild Wasabi ink. The border was made out of a 4.25″ x .75″ strip of Daffodil Delight card stock and a 4″ x 5/8″ strip of Whisper White card stock. I used my Hexagon punch to cut the “V” in either end of the strips making up the banner. 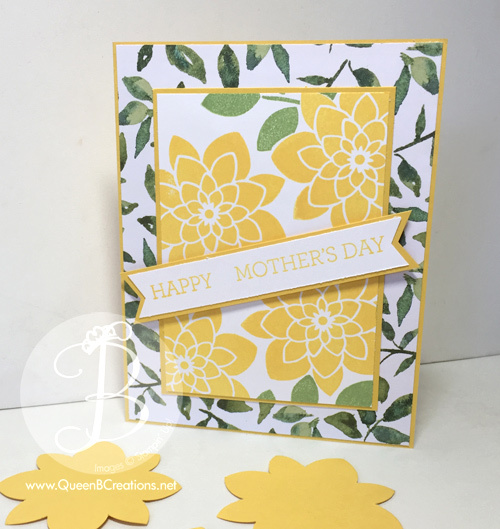 I then used Daffodil Delight ink and two stamps from the Crazy About You stamp set to stamp Happy Mothers Day onto the Whisper White strip. The banner was then added to the card using dimensionals. 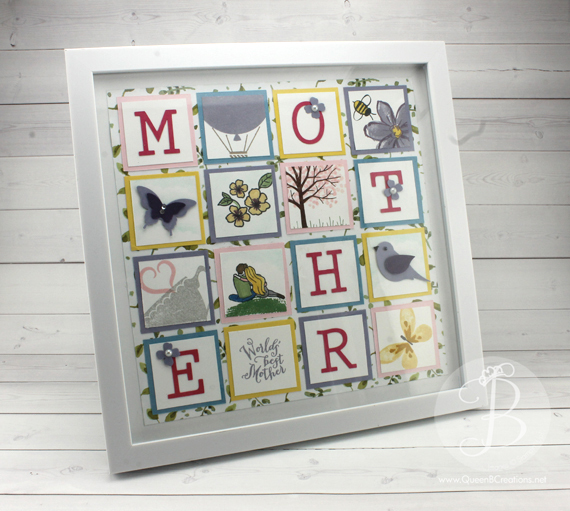 I hope this card inspires you to go stamp something cheery for a mom in your life!